Fun With Charges was developed as part of a graduate multimedia class under the guidance of Professor Perlin. 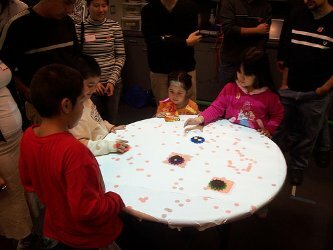 The setup included a ceiling-mounted projector, an infrared camera (using the Intel OpenCV library to track motion), and a circular table for a projection surface. 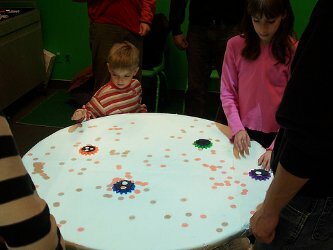 Using this equipment, the tabletop became an dynamic surface where users could interact with a game or simulation through the movement of four numbered pucks (used by the vision system). The goal was to develop a simulation of "tiny things" for a day-long exhibit in the New York Hall of Science. This concept was chosen because of the difficulty in building physical experiments that retain the properties of small objects, but allow user interaction (things like molecules or DNA). The virtual medium of our setup removed these obstacles. Working with three other students, we developed an interactive simulation of charged particles. Users could move "magnet-like" blocks around the simulation. Two particle systems, one positively and one negatively charged, stuck or repulsed from the blocks. When users move a puck, the corresponding block moves to the new location and also switches polarity. 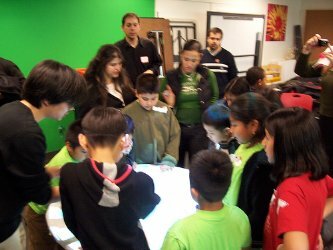 The hope was that users (children) would be able to use the simulation to identify and explore the physics behind charges.